In January/February 2010 I had arranged for an individual tour through West Africa. After a great experience in Tanzania, Kenya, and Rwanda on an individual tour, I decided it is worth it to pay for an individual tour. It allows me to stop wherever I want, take pictures for as long as I want to and rearrange things as I see fit. The tour was organized by Balanzan Tours. I did have a bit of a problem with them, but eventually we came to an agreement how to solve it. The trip was done with a Toyota Land Cruiser 4x4. The car was a little unreliable at times, having difficulty starting. It needed to be pushed to start whenever it stalled with a hot engine, which happened several times. In Bamako, the car broke down completely. It took my guide a full day to find a replacement car. The second car got me without further problems to Dakar in Senegal. 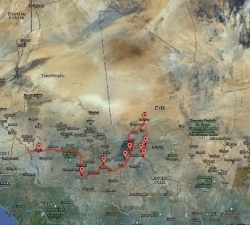 Coming from Burkina Faso by car, we drove northwest into Mali. The first town we reached was Koro with a very nice mud brick mosque. From there I visited Songho with a sacred site for circumcision rites. From there we drove to Sangha, a village on the Bandiagara escarpment on the plateau in Dogon country, where I stayed for a couple of nights. The Cliff of Bandiagara (Land of the Dogons) is a UNESCO World Heritage Site. On the full day there I went on day long hiking tour down the escarpment from the plateau to the plains to Ireli, then to Amani with the sacred crocodiles, back to Ireli for lunch, then to Banani, and back up to the plateau to Sangha. It was about 6 hours and 16 km (10 miles) of walking. The next day we drove from Sangha to Douenza for the next overnight stop, through several Dogon villages. From there we drove to the Gourma elephant reserve. We went on elephant watch that afternoon, and again the next morning. Overnight accommodations there was a mat on the dirt floor outside. I had a sleeping bag and a mosquito net with me for the camping part on the Niger River, so it was OK. No running water, just a bucket of cold water for washing. After elephant tracking in the morning, we drove on to Tombouctou (Timbuktu), the mysterious Touareg city on the edge of the Sahara. Tombouctou (Timbuktu) is a UNESCO World Heritage Site. In order to get to Tombouctou, you have to take a ferry across the Niger River. The ferry takes about 45 minutes to drive up the Niger River to Tombouctou. We were lucky that the ferry was right there waiting for us. If you are unlucky, you may have to wait 3 hours before the ferry runs next. That afternoon I went on a tour of Tombouctou, and on a camel ride for a sunset view. After another brief city tour the next morning we went to the Niger River to the boat that would carry me for the next three days. It was a small boat with a crew of two, but plenty of room for me and my guide. The boat crew cooked all our meals right on the boat on a charcoal stove. They put up a tent for me for the two nights that I spent on the Niger River. The boat was driving up the Niger River for about 7 hours on the first day, 12 hours on the second day, and 8 hours on the third. It was a pleasant boat ride, with lots of bird watching, and picturesque settlements, boats and fishermen along the river. In the afternoon of the third day on the river we stopped just short of Mopti, and were picked up by our Toyota Land Cruiser for a short, one hour drive to Mopti. In Mopti I did a city tour. There is a nice mosque and a busy market and harbor. The next day we continued west to Djenné. 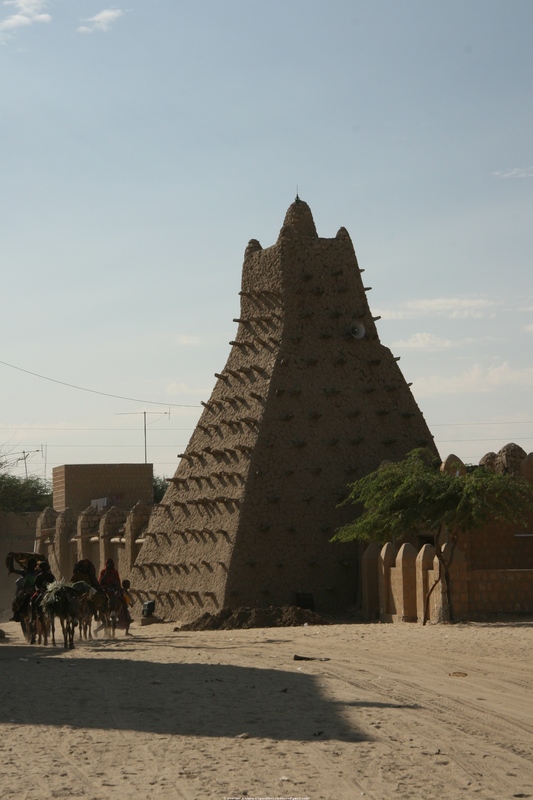 Djenné was founded in the 10th century and is one of the oldest cities in Africa. It is famous for the largest mud brick structure in the world, its beautiful mosque. Old Town of Djenné is a UNESCO World Heritage Site. The hotel there didn't have hot water, but my guide arranged for a bucket of hot water. The room was full of mosquitoes, but they came and sprayed bug spray. That, and the mosquito net, made for an uneventful sleep. From Djenné we drove to Ségou, the site of the Festival sur le Niger, a big music festival, around which my trip was planned. I spent three nights in Ségou and visited the festival. After the festival we continued west to Bamako. In Bamako our car broke down. I was scheduled to spend only one night in Bamako, but it took them more than one day to find a replacement car, so I lost one day there. The hotel was away from anything interesting, and I was waiting for word about the car all day, so I didn't get to see anything during that day. After the second night in Bamako, they had a replacement car and we continued west to Kayes, the last town in Mali. From there we crossed the border to Senegal. Of the three countries that I visited on this trip through West Africa, I liked the people in Mali second best (after Burkina Faso). There was a distinct gradient in the propensity of people to smile from Burkina Faso to Mali to Senegal. A similar gradient was in the pressure from hawkers. There was much less pressure from hawkers in Burkina Faso than in Mali, on the other hand, in Senegal it was even worse than in Mali. The hawkers were everywhere, and if not hawkers, there were kids begging. People were in general neither overly friendly nor unfriendly. Everybody everywhere seemed to want to sell me something. Even when they just seemed to want to chat with me, inevitably later on they asked me to come to their store so they could sell me something. People in general didn't like it when I wanted to take pictures. Kids frequently asked for money when I took pictures. The overnight accommodations were quite varied. In the Gourma elephant reserve, I only had a mat on the dirt floor outside for accommodation. The best hotel was in Bamako, but even that was not anything to write home about. In general, all the hotels were quite clean. In a few hotels I didn't have hot water. In the hotel in Djenné my guide arranged for a bucket of hot water, which helped. In the other two places with cold water I just had to live with cold showers. Surprisingly enough, almost every hotel had air conditioning. The food was decent, basic local fare, nothing special, but usually tasty. The exception was breakfast. All I got was a piece of baguette and some marmalade. Sometimes I also got a piece of butter. With it I got hot water and Nescafe. That was it, nothing else! The local beer is a fairly good lager, just what I like in a beer. It was quite inexpensive, especially in the smaller towns. But even in Bamako in the hotel, it was reasonably inexpensive. Outside of the main cities, people live in small villages, mostly mud brick and straw huts. Food and other things are stored in separate granaries. Each family has a man's and a woman's granary. Women are not allowed to look in the men's granaries, and vice-versa. My guide said that part of the reason for this is that men are afraid that a woman might leave them if she looks in the man's granary and doesn't see enough food there. The official language in Mali is French. There are may different tribes in Mali, all speaking different languages. Some are farmers, others (e.g. the Fulani) are herders that raise cattle, goats, and sheep. The Fulani are still mostly nomadic, moving their livestock to new pastures regularly. The Dogon in the southeast of Mali have lived very isolated for centuries. So isolated in fact that each valley developed its own language that can't be understood by the other Dogon, let alone by the other tribes in Mali. There are several dozen languages in the Dogon area alone. Women mostly wear traditional ankle length dresses. I did see women wearing western style clothes, but these were distinctly in the minority. Men's clothing was more equally divided between traditional kaftans and western style t-shirts and pants. One thing that had to do with clothes was baffling me till almost the end of the trip. When women work with things on the ground, they bend down from the waist, not squat down in the knees. I somehow always had an odd feeling about that, it just didn't seem right. I finally realized why when I saw a teenager in a mini skirt in Saint Louis in Senegal. I am a cross-dresser, and a while ago I started wearing mini skirts myself. I very quickly learned the lesson how to pick something up from the floor while wearing a mini skirt. You do not bend down from the waist, as I saw the women in West Africa do, when you wear a mini skirt, unless you want do flash the people behind you. I had learned that embarrassing lesson so well, that it made me uncomfortable even to see other women bend down like that. However, women in West Africa almost exclusively wear ankle length dresses, so they can afford to bend down from the waist. The most common food crops are millet and sorghum. My visit was during the dry season, so the fields were fallow. After the harvest, the millet and sorghum are thrashed. The millet straw is collected and stored in piles to dry. The straw is later used as building material. The other important building material is mud. There are mud holes near every village, where the villagers make the mud bricks for their houses. The mud bricks are sun dried only, they are not fired. The mud plastering has to be redone every year after the rainy season. That is the reason why many of the larger buildings look like porcupines, with wooden beams sticking out. The wooden beams are used to climb on the buildings to redo the mud plaster on the walls. I saw men, women, and children make these mud bricks. In general, it seemed that most of the work is done by women (which was also what my tour guide told me). Children also work frequently. The men seem to mostly sit around and talk. This was the same in Burkina Faso and Senegal, and was similar in East Africa, although maybe not quite as obvious. Transportation for people between cities and within is with buses. Private transportation is a lot with motorcycles and mopeds. Outside the cities a lot of transportation of goods is with donkey carts. In the towns, people drawn carts are frequently used to move goods around. And a lot of goods are carried by men and women on their heads, especially when they bring goods from the settlements to the markets and bring back their purchases. The markets are an important part of society. In the larger towns, the markets are daily, in the smaller villages they may be only once or twice per week. I visited markets in several towns. It was quite interesting to walk through these markets and watch the people. Everything is for sale that you may need. The most important part is usually the food market, other parts are for other household goods. With the population density fairly high in the area that I traveled,` there is no large wildlife left. It all ended up in cooking pots a long time ago. The only wildlife that I saw was birds and small animals like lizards and geckos. The only exception during my trip was the elephant reserve in Gourma. These elephants are the northern-most elephants in Africa. The bird life was very interesting, especially during the boat trip on the Niger River. Mali is a fairly poor country. In order to make a living, people everywhere are trying to sell something. Anywhere there are tourists, the hawkers can be pretty insistent. There are lots of picturesque villages in Mali, especially along the Niger River. There is not much wildlife in most parts of Mali, other than birds. Even bird life was not quite as varied as I expected, but still quite interesting, especially along the Niger River. The highlights of the trip were Tombouctou (Timbuktu), the trip on the Niger River, and the northern-most elephants in Africa. Mali is certainly worth a visit, but be prepared to fend off hawkers in every tourist area. I have organized the pictures in several pages.